Fever in chemotherapy-induced neutropenia (FN), if due to infection, is the most frequent potentially lethal complication of chemotherapy for cancer . When absolute neutrophil count (ANC) drops below 0.5 × 109/l, the risk of life-threatening bacterial infection increases . Time to antibiotics (TTA) usually refers to the amount of time passed from arrival at the hospital to start of intravenous antibiotic administration [3–5]. Different definitions are sometimes used, for example, time from the first detection of fever  (Fig. 1). 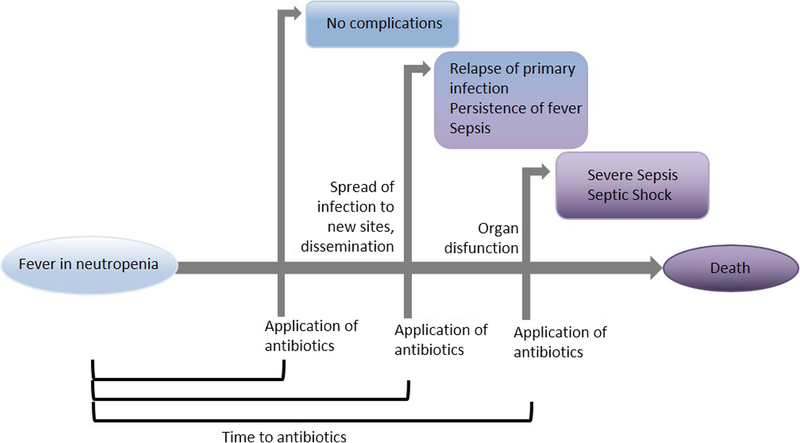 There are numerous different antibiotic regimes, in both adult and paediatric protocols [7–10]. The coverage of these antibiotics is certainly less varied than the specific antibiotics used: thus, differences between regimes are more likely to be related to the route of administration, including absorption and dosing, than the specific antibiotic used. In practice, TTA is often longer than the 60 min suggested in guidelines [3, 31]. Assuming that a shorter TTA leads to clinical benefits, several groups have tried to identify and reduce sources of delay by implementing interventions in EDs or hospital wards [3, 31–33]. Such interventions may include education of patients, implementation of staff consensus guidelines, high triage level for all patients with FN, and rapid rooming in of all patients with FN, alone or in combination. A systematic review collecting studies evaluating such interventions will help to identify reasonable interventions amenable to translation into clinical care and avoid repetition of unsuccessful approaches. It will also outline whether there is the need for further development of such interventions.